In Abdulaziz Ashour’s debut London exhibition at The Park Gallery, the Saudi Arabian artist tackles the themes of language, memory and literature in his latest body of work. Continuing in his collage-based practice which he has worked with since the early 2000s, Ashour has strengthened this creative process with eloquent, sensitive results. Ashour views paper as a vital element, a living organism with which we can have a relationship and as a primary tool for the messages of humanity, science, knowledge and art. He manipulates paper in a manner that truly captures the essence of the material and the memory of its former purpose. For Ashour, the colours and topography of paper, the fragrance emitted from the pages of a book and the smell that hangs on the palms of ones hands like perfume dominate his imagination. 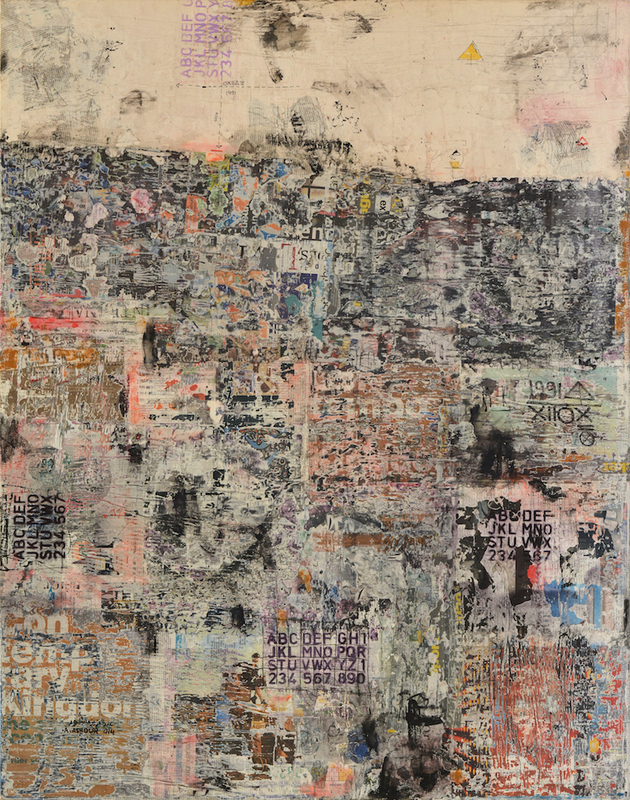 This body of work evokes memories of the traces of posters on walls and lampposts, the sticky remains of a soaked, flattened newspaper on the pavement and the possibility of one being able to transform these fleeting moments into the permanence of an artwork. In addition to his artistry, Ashour is both an avid reader and writer. It was through the novels of Milan Kundera, Paulo Quila, Isabel Allende and others that he learnt to follow the most beautiful phrases he came across. Through literature he acknowledged the vital importance of language in visual imagery and its prowess in delivering a memory of location and time. By planting the written word directly into his art, Ashour is both able to capture the essence of the written word as well as allude to the beauty of language. Abdulaziz Ashour was born in Jeddah, Saudi Arabia in 1963 where he still lives and works. Like many Saudi artists, he began exploring his interest in fine art whilst still engaged in full time work at the Ministry of Energy but since 2009 has devoted himself full-time to his artistic practice. A highly regarded and innovative artist, writer and arts administrator, Ashour has carefully documented the work of Modern and Contemporary Saudi artists as they have progressed fitfully over the last fifty years. Director of the Arts Committee of the Jeddah Arts & Culture Organisation between 1994-98, acted as the arts consultant to the Ministry of Culture and Education in Saudi and responsible for establishing a cultural forum in Jeddah, Ashour has himself held numerous solo exhibitions in Jeddah, Riyadh, Cairo and Sharjah and participated in many international exhibitions including the Biennales of Sharjah, Cairo, Dacca and Muscat and shows in Mexico, the USA, Tunisia, Kuwait and Jordan that have resulted in many awards including the Golden Palm award in Kuwait. His work is represented in many important international collections and has proved an important influence for many Saudi artists working today. His iconic ‘Newspaper Series’ deals with the subject of the reporting and documentation of art in Saudi, subject matter that he continues to re-visit to this day. Showing a masterful handling of simple media and colour, the tones of which subtly convey the artist’s message, Ashour creates thought provoking yet aesthetically enthralling works of art.